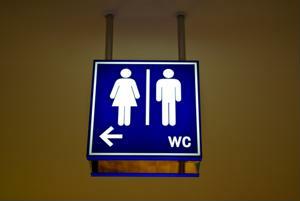 Everyone has been in that nightmare situation when it seems that you'll either suffer irreparable harm from a burst bladder or have to go in the street. Not a single Dunkin Donuts, Starbucks or Barnes and Noble seems to have a bathroom (where do these employees pee? ), there aren't any local public toilets (where are your tax dollars possibly going?) and it seems like your life has never been and will never be so heartbreakingly difficult. Well, luckily, there's an app for that. A whole bunch, in fact. There are also a few common sense tips. And, in Australia, there's even a nation-wide public toilet map. A number of iPhone and Android apps exist to give you a helping hand finding public toilets. The handy GPS features equipped on smartphones mean that apps can pinpoint exactly where the closest public toilet is to your location (provided you've got plenty of WiFi and/or cell service). One of the lead smartphone applications is produced by Charmin (the toilet paper company featuring the cuddly bears). The tongue-in-cheek title, Sit or Squat, delineates the line between clean and comfortable restrooms and the sort of greasy spoon and trucker joints you won't want to stick around in longer than you have to. Although beggars can't be choosers, it's a useful tool to have in a pinch - especially for the squeamish. For those ill-equipped for public toilet apps, there are some common sense rules to follow. Parks and public spaces used for concerts or city-related events are more likely to house public toilets, as are government buildings. Don't expect public transportation to offer any opportunities, however. When down in the subway or waiting for a bus, you're probably on your own. Bustling downtown fast food restaurants - ones with high traffic and few seats - aren't likely to have public restrooms either, so don't waste your time hunting around in them. A good tip would be to check movie theaters. The other option is to move to Australia. Here, the government has noted more than 10,000 public toilets on an interactive online map that can be searched by location or - for the merely curious - browsed. While they don't offer printed editions of the map, it is quite a sight to see and can be linked up to your smartphone's GPS. Talk about a great use for tax dollars!